blessed is the man who, when he catches a fish, understands that he has in his possession something more than a fish. So true, solitude, relaxation, perhaps a time to think and reflect. I must add, I am jealous of this man;s fishing spot. I'd gladly trade him 4 of my spots for one day on his. Do you imagine that he has any idea of the glory of this scene, one that people in other places pine after? 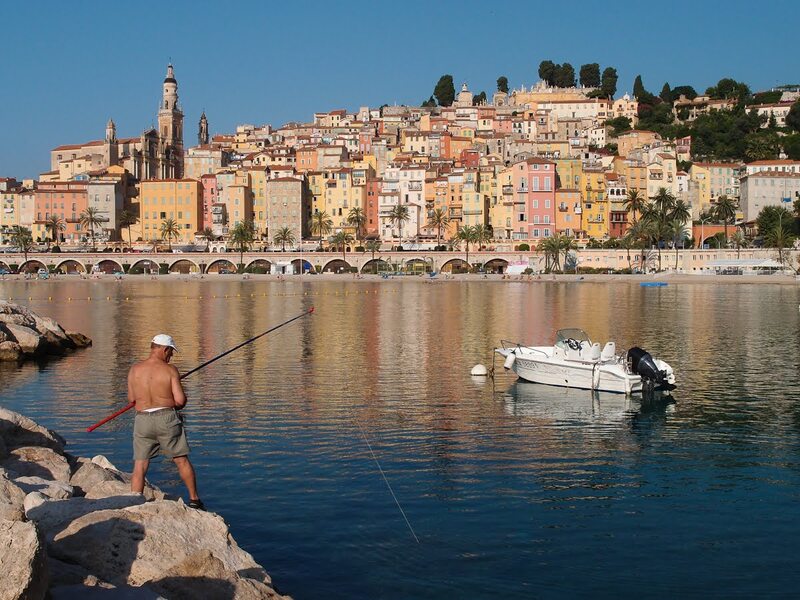 Beautiful photo, Jilly, capturing the exquisite colors of Menton. Your quote from Thoreau is perfect for today. The fisherman should be looking up and to the left, not down into the water. We have people who fish in the surf along our beach. They have to watch the water to make sure that a wave is not going to knock them off the rocks on which they like to stand. What a picture, Jilly! And, your quote is perfect. I often think it would be great getting up early and trekking to a quiet fishing spot, except that if I actually caught a fish, what would I do? What a fantastic quote to go with an equally fantastic view! Lovely morning impressions! Have you been an "early bird" several days or did you take all the photos the same early morning? That is so beautiful the it makes me ache! And a perfect quote. Jilly I admire you getting up so early for shots. This one is another winner. Of course your quotes always inspire me. No matter how hard I try, I never find such perfect ones.